The first 50 copies will include a special numbered and signed insert by the band. First ed. of 900 copies in a smoking hot full color book bound gatefold case and 8 page lyric booklet. 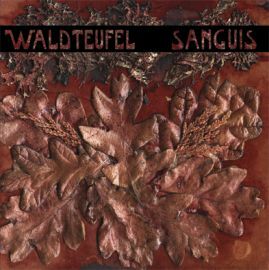 After more than three years of research & development, WALDTEUFEL finally deliver their new opus: SANGUIS. First conceived as a 12”, it has since blossomed into a full-length album. SANGUIS features lyrics by two nearly forgotten German personalities – Stefan George & Alfred Schuler, who can be considered the two opposite poles of the ‘Cosmic Circle,’ a group of mystically inclined German authors that were active in Fin de Siecle Munich– as well as lyrical fragments from the ancient Indian Vedas. Musically, it runs the gamut from dense hypnotic atmospheres, ritual passages to metallic chants and triumphant percussion-heavy hymns. It is the most adventurous and varied WALDTEUFEL work so far, and expands and deepens the themes explored in the first album “Heimliches Deutschland.” The instruments used include everything from accordeon, violin, wood percussion, horns to electric guitar, Moog synthesizer and that most archaic instrument of all: the voice. SANGUIS intends to focus the listener’s attention on the realm that lies beyond all appearances, a radiance which is mirrored in our most elemental selves: the essence of breath and blood that surrounds our spiritual core. SANGUIS was entirely recorded by Markus Wolff and Tyrsson Sinclair. Wolff has had a long musical career as a drummer/visual artist of the legendary percussion/performance collective CRASH WORSHIP. He has also been a live drummer/percussionist for many friends, including SORIAH, IN GOWAN RING, BLOOD AXIS, WITCH-HUNT, ALLERSEELEN, and CHANGES as well as the drummer on the ALETHES “Aletheia” album. He is currently also active with Black Metal formation L’ACEPHALE and the experimental chamber musick ensemble A MINORITY OF ONE. In ages past, Tyrsson Sinclair commandeered the extreme metal entity WARHATE. His current solo-project is NORTHMAN and he is also developing a new project called HAMRAMR. That cheeky little wood devil. It was weird enough when Markus first donned his Waldteufel hides in '95. After the sub-tribal thud of Crash Worship, such earthen tones seemed almost extra-terrestrial. 12 years on and he continues to crack open die Erde, and houses her escaping spirits and demons in lieder for the Vreaky Volk to sing. Sanguis is well named as it not only taps into the stuff this life's veiny floe, but also happens to be bloody brilliant. The opening psychedelics raise the standard, call the wild and deliver a definitive apocalyptic folk-you to genrefication. A droney accordion meditation sounds like some avant garde Wehrmacht era B-side, then followed on by a slow and sturmy Sitzkrieg of black metal. Markus's baritone rolls up a centre column of buzzing guitar flanks like a Panzer division pushing back some unseen musikal enemy. This bold and inventive advance is supported further on by sonic cannon rounds of rounds and canons firing ever thickening salvos of voice and sound, as if midwifing some impossible juxtaposition of an ersatz gothic Beach Boys and a Bier drunk Popol Vuh. Despite the technology and the occasional glints metallic, Sanguis sounds built of ancient marrow. Markus's vocals are a powerful root upon which girthy boughs of folklore expand Himmelward. German lyrics add to the poetry and provenance resulting in a sort of Neue Alte Deutsche Welle (NADW). Or, perhaps, Zauberkraut (Achtung Herr Kommisar: Zauber=magic. Alles Klar?). Whatever you prefer to call it, Waldtuefel is more delicious than Dunkels and will knock over anyone's Maginot line without chipping a hoof. • “Totentanzlied” on SONNE HAGAL full-length album – forthcoming.